PierTech Systems will be in Las Vegas, Nevada, January 23rd through the 26th for the World of Concrete. The World of Concrete tradeshow is the largest annual event dedicated to concrete and masonry professionals. PierTech will be exhibiting in South Hall, Booth #13139, showcasing our top of the line helical piers, piles, anchors, and installation equipment. Stop by our booth to find out more about our high quality patented foundation repair products and find out what jobs we can assist you with in 2018. If you are looking to become a PierTech Certified Installer, we will be hosting a FREE Training Seminar on January 23rd at the Luxor Resort and Casino. PierTech specializes in training potential installers with varying degrees of experience to properly calculate, plan, and execute the installation of helical piers, piles, and anchors. A $250-dollar deposit will be required upon registering for the event, which will then be applied to any purchase of equipment and/or material. Please call us today to reserve your spot at our Las Vegas event. PierTech will also be hosting an evening reception at the Mandalay Bay Resort and Casino on January 24th to thank our customers and friends for their business and continued support. Appetizers and drinks with be provided. The reception will begin at 6:00 pm. Please join us for a fun-filled evening, call us TODAY to RSVP. 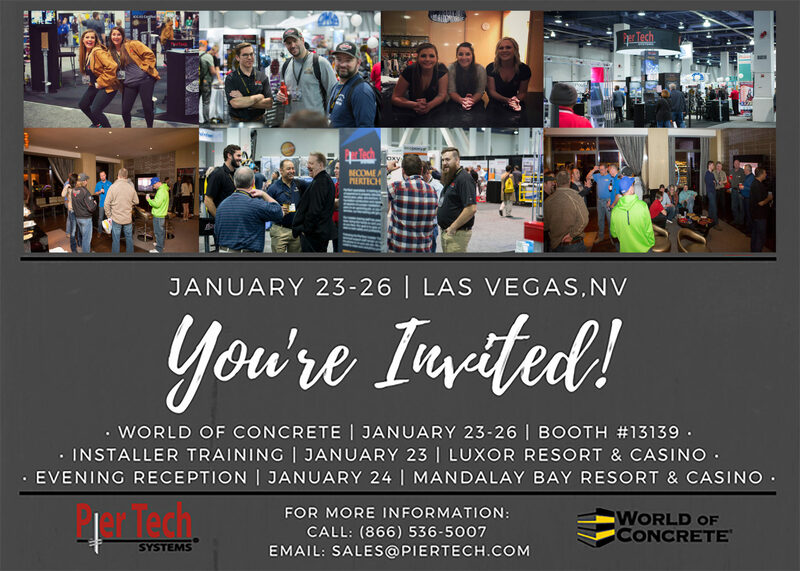 The PierTech Team looks forward to seeing you in Las Vegas for the World of Concrete, Installer Training, and our Evening Reception. Don’t forget to reserve your spot for training and RSVP to our evening reception! https://www.piertech.com/wp-content/uploads/2013/04/piertechlogo.png 0 0 Kevin Kaufman https://www.piertech.com/wp-content/uploads/2013/04/piertechlogo.png Kevin Kaufman2017-12-20 15:29:082018-11-29 16:22:38Join Us at the 2018 World of Concrete in Vegas!